Today’s blog is one I am VERY excited to share with you all as it has been on my wish list for oh so very long- my master bath! I’ve had this project in the works for a while, looking for the perfect tiling, lighting, fixtures (all Brizo everything), even down to the handle on the toilet! As many of you know, I’ve loved the black and white look since I started working in design and am so thrilled to have been able to pull off this classic combo here in my own home. First off, because I had no allowances to take down any walls I made it priority to keep the space feeling as large and open as possible. 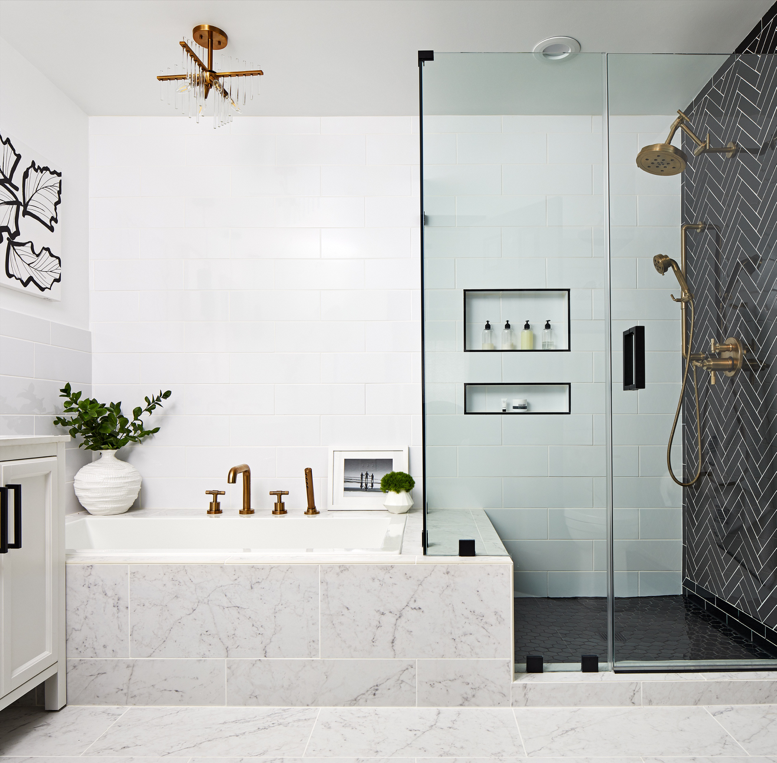 Next, I immediately fell in love with the idea of using black glass from Mosaic Tile. It is just the most beautiful shade of bold black and paired with a herringbone pattern (I’ve been obsessed with this pattern since my teens! )- say no more! I then chose to fill that in with black grout to blend in but also because, let’s face it, it’s easier for cleaning! Wedge Construction came in and worked their magic to put this all together. And let me tell you, herringbone is A LOT of work. Then, Dulles Glass in and put up the all glass enclosure and I was officially weak in the knees! But above all, the icing on the cake for me has got to be my beautiful Brizo Litze collection- I like to think of it as the jewelry of my bathroom. It’s amazing to feel like I have my own chic spa just steps from my bed! And that shower head…don’t even get me started! Another great feature are those three pendants above my vanity. They drip perfectly from the ceiling and have different lighting levels that can set up all kinds of moods. At night, I love to leave it on the softest glow which gives me the perfect accent lighting. The lighting above my tub is another gem and really adds that glam factor. The night before the shoot (talk about leaving it to the last minute) me and my love, Judd, painted the artwork above the tub! I hope you all enjoy this as much as I do!